How will naval aviation employ unmanned aerial vehicles (UAVs) in the future? The answer is, of course, “it depends.” It depends on technology, on the economy and budgets, on whether we are at war or peace, and on leadership. It also depends on less interesting things like how squadrons and air wings are organized. Given the rapid advances in unmanned systems technology and the success of unmanned platforms like Predator and BAMS-D, UAVs will certainly proliferate and significantly impact the future of naval aviation. If properly integrated, future manned-unmanned teams could deliver exponential increases in combat power, but integration of unmanned aircraft requires a level of trust in autonomous systems that does not yet exist in naval aviation. Building trust will require technical improvements that increase the “trustworthiness” of UAVs, but it will also require naval aviation to establish organizations that enhance trust in UAVs with the goal of fully integrating them into the fight. Indeed, organization will likely be the limiting factor with regard to the pace of integrating trusted UAVs. Therefore, naval aviation should consider the impact organization will have on the ability of aviators to trust UAVs and balance this among the competing requirements for introducing new unmanned platforms. Although naval aviators are perceived as natural risk-takers, they are trained to take no unnecessary risk and to mitigate risk throughout every evolution. Therefore, UAV integration will occur only when aviators trust UAVs to the same extent that they trust another aviator flying in close proximity as part of a strike package or during coordinated antisubmarine warfare sorties today. The proliferation and success of UAVs in the past decade belies the fact that aviators still do not trust them. The vast majority of unmanned aircraft continue to fly only scheduled sorties in pre-established air space in order to ensure separation from manned aircraft. In addition, naval aviators operate with an abundance of caution around UAVs. Aircrews are briefed on planned UAV routes and orbits prior to a mission and routinely deviate from airspace assignments or coordinate new air space in flight to ensure safe separation from UAVs. Being notified that an operator has lost communications with a nearby UAV (i.e. it is autonomously executing a pre-programmed reacquisition profile) assists manned aircraft, but it also raises the hair on the back of an aviator’s neck. In the terminal area it becomes necessary to fly closer to UAVs, which is accomplished safely with the assistance of ground air traffic controllers. Still, as with any congestion, the threat to manned aircraft increases, especially in expeditionary locations. After several, near mid-air collisions with UAVs in 2010, one task force commander grounded his manned aircraft at a remote operating location until he was assured that the local control tower and UAV operators, who were physically located half-way around the world, would improve procedural compliance. Anecdotes like these abound, demonstrating both the adaptability and skepticism of aviators flying near UAVs. After nearly a decade of sharing the sky with UAVs, most naval aviators no longer believe that UAVs are trying to kill them, but one should not confuse this sentiment with trusting the platform, technology, or operators. Building trust in autonomous systems should be a goal of those who will design the UAVs of the future as well as those who will employ them in the Fleet, because establishing trust in autonomous systems may be the tipping point that will unleash the revolutionary combat potential of UAVs. Naval aviation could fully integrate trusted UAVs into every mission area of every community. Unmanned tankers, wingmen (wingbots? ), jammers, decoys, missile trucks, minesweepers, and communications relays could be launched from the decks of aircraft carriers, destroyers, support ships, from bases ashore, or from aircraft cargo bays, wing pylons and bomb bay stations in the coming decades, truly revolutionizing naval aviation. However, lack of trust is a critical obstacle which must be overcome before such a proliferation of UAVs can occur. There are several technological improvements that can contribute to trust by enhancing situational awareness and the safety of both manned and unmanned platforms. Improvements in see-and-avoid technology are needed to assist UAV operators when the UAV is flying in proximity of manned platforms. 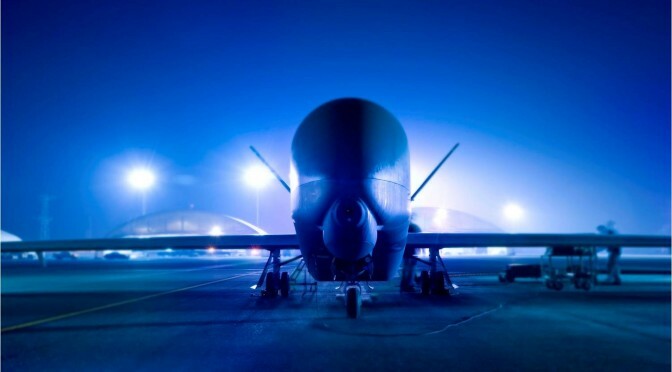 UAV command and control architectures and traffic collision avoidance systems (TCAS), as well as radars and data links, require improved reliability, security, and flexibility to ensure survivability in an anti-access environment or in the face of cyber or space attacks. Systems that provide manned platforms with increased situational awareness regarding the location of UAVs and the intended flight profile would also enhance trustworthiness. Today, the vast majority of naval aviation is not comfortable sharing an altitude block with a UAV in day, visual meteorological conditions (VMC), much less during war at sea in an anti-access environment. Technological improvements that make UAVs more trustworthy are necessary but not sufficient for establishing trust between an aviator and a machine. Sufficient trust will also require training, mission experience, and technical understanding of the system. Given the technological enhancements described above, it is not a stretch to imagine a manned F-35 establishing a CAP station with a UAV wingman, or a P-8 crew employing UAVs or unmanned undersea vehicles (UUVs) to search for a submarine, or an E-2D using a UAV to extend the range of its radar or data link, or an EA-18G commanding a UAV to jam air defenses or deliver an electromagnetic pulse. There remain challenges to fielding these capabilities, but the technology will soon exist to safely integrate UAVs into these naval aviation missions and many more. This level of integration raises numerous questions about UAV organizations and their personnel. Who would be responsible for the success, failure, and safety of the missions? Would each community operate UAVs that support its mission or would a UAV community operate all UAVs performing the full spectrum of naval aviation missions? How would a UAV operator develop the expertise to execute complex tactical tasks in close coordination with manned platforms? What tactical and technical training will be required to integrate UAVs in this manner? How are the skills of pilots and UAV operators similar? How are they different? What portions of the unmanned sorties are accomplished autonomously and which require a link with a UAV operator? From where will UAVs launch and recover? From where will they be controlled and who will control them? The answers to these questions depend on how squadrons of the future will be organized to command, operate and maintain the UAVs. In turn, each organizational model significantly influences the amount of additional training, coordination, and experience required to achieve the trust necessary to fully integrate UAVs. Consider the issue of who controls the UAVs. Some options include: control by the pilot of a manned aircraft themself; control by another aviator in the same aircraft or section; control by an aviator from the same naval aviation community outside the section; control by a UAV operator from a UAV community — aboard ship, ashore, or airborne; and fully autonomous operation. The amount of trust required to execute complex missions in close proximity to UAVs is the same regardless of how the UAV is controlled, but the amount of trust inherent in each scenario varies greatly. Decisions about these elements will significantly influence how quickly aviators will be able to trust, and therefore integrate, UAVs. As technology overcomes the challenges posed by the various capabilities implied above, organizational structures will determine how quickly UAVs can be integrated into the fight. Naval aviation’s plans for its next UAV, the Unmanned Carrier Launched Airborne Surveillance System (U-CLASS), will prudently focus on ensuring the safe introduction of a novel platform in a budget constrained environment. Yet, looking beyond U-CLASS, there is the potential for naval aviation to exponentially increase its combat effectiveness by integrating UAVs in every mission area. Technological innovation is necessary to make UAVs more trustworthy, but naval aviation should also understand how organization will facilitate or impede the integration of trusted UAVs. The optimal structure of future UAV units will maximize trust between manned and unmanned platforms and allow for innovation and growth in integration. Commander Smith is a Naval Flight Officer and the former Commanding Officer of VP-26. These are his views and do not reflect the views of the United States Navy. This article featured as a part of CIMSEC’s September 2015 topic week, The Future of Naval Aviation. You can access the topic week’s articles here. What’s behind trust issues are robust C2, culture, and shared experience. In the UAV community, there is far too much hype about autonomy, which is the antithesis of C2 (when autonomy is properly defined). I’m not wild about a tactical manned aircraft that flies itself and makes its own decisions. We should not hype the notion of UAVs that might technically have such a capability. Emphasis on robust control and confidence in what’s behind the C2 is crucial. And behind the C2 of the UAV and on-board the manned aircraft joins the question of culture. When both operators can break bread in the wardroom, that will be a beginning of trust between cultures. I would assert the technology is, or will become, secondary. Just about all Airbus aircraft, I’m told, have the technology to fly themselves, and do so, in practice, for all of about eight minutes or so per flight. But tactical air operations differ widely and people operating the various systems have to join in command understanding of CONOPs, roles, and tasks. Deep trust that all understand these and can perform confidently and professionally is fundamental. Shared experience comes from exercising together in realistic flight training and simulations. We can’t have UAVs in a can that are only rolled out when the real-world calls just because their operators don’t need hands on proficiency. There was once much talk of this and hopefully that has been solidly suppressed. Teaming requires real relationships in “train as you expect to fight” scenarios. In addition to organization, these are keys to building trust needed to do the mission. Great points, Jeff. I agree that the technology will become secondary to issues like C2, culture, and experience. Those factors are significantly impacted by how naval aviation decides to organize UAV units. The more UAV operators are separated from other aviators (different squadrons or communities) the more difficult it will be to create those opporunities to break bread or conduct realistic training/exercises together. great points on C2 & trust. I wish I had your optimism about developing functional squadron organizations to integrate UAVs & manned A/C. unfortunately, I sat next to the gent who developed the squadron manning plan for the SH-60R/S rollout. his initial draft received the traditional shotgun blast to the face, not because it did not account for use and functionality of the new birds, but because it did not preserve CO/XO & DH billets to support “the community”. the final version sacrificed functional alignment to ensure that folks got their tickets punched.